After understanding the existing situation and setting your organisation’s/city’s objectives, the next crucial step is to identify the most suitable innovations for Public Transport in your area. …but what do we mean by the term “innovation”? This word has various definitions and interpretations. In the frame of CIPTEC, with a focus on Public Transport, the meaning of the term “innovation” was extended to include ‘every idea coming from other fields that is currently not applied in Public Transport, or even any idea that has been developed and/or is being deployed in some areas of the world and that has not yet been adopted in other areas’. In people’s perception, innovation is often interpreted as coinciding with technology, especially high technology. This is not quite right. Innovation concerns every original idea that changes the way things have been done so far. It can simply combine existing applications and technologies in an arbitrary way and at the lowest possible cost. What is the most appropriate way to identify innovations for making Public Transport more attractive to current and potential passengers? The CIPTEC toolbox provides an appropriate portfolio (inventory) of innovations. One group of innovations consists of currently available innovative concepts and solutions coming from the Public Transport (PT) sector that target both traditional customers and new groups of customers in order to better respond to customer’s needs, requirements, expectations and new lifestyles adopted. This group also includes innovations (e.g. concepts, services, business models) derived from or applied in Other Transport (OT) systems and/or Other Business (OB) sectors, that are considered promising for the Public Transport sector. For instance, the transport sector features a variety of interesting concepts and innovations that have not yet been applied in Public Transport, (e.g. in air transport, car leasing or parcel delivery services).Some of them have a high transferability potential, and their cross-sectoral impact is extremely promising. Another group includes entirely new innovative concepts and solutions, or certain existing innovations that can be further improved or elaborated by implementing collective intelligence processes and methods,(that usually involve both experts and users). Given its user-centred nature, collective Intelligence is growing increasingly popular, and is being applied in many projects and organisations to generate innovation. The CIPTEC project carried out a detailed desk research with the aim of identifying existing innovative concepts/solutions with the potential to create a favourable environment for a significant growth in public transport at limited extra costs. However, as technology is rapidly evolving, you can always come across new innovative concepts and solutions from all around the world! 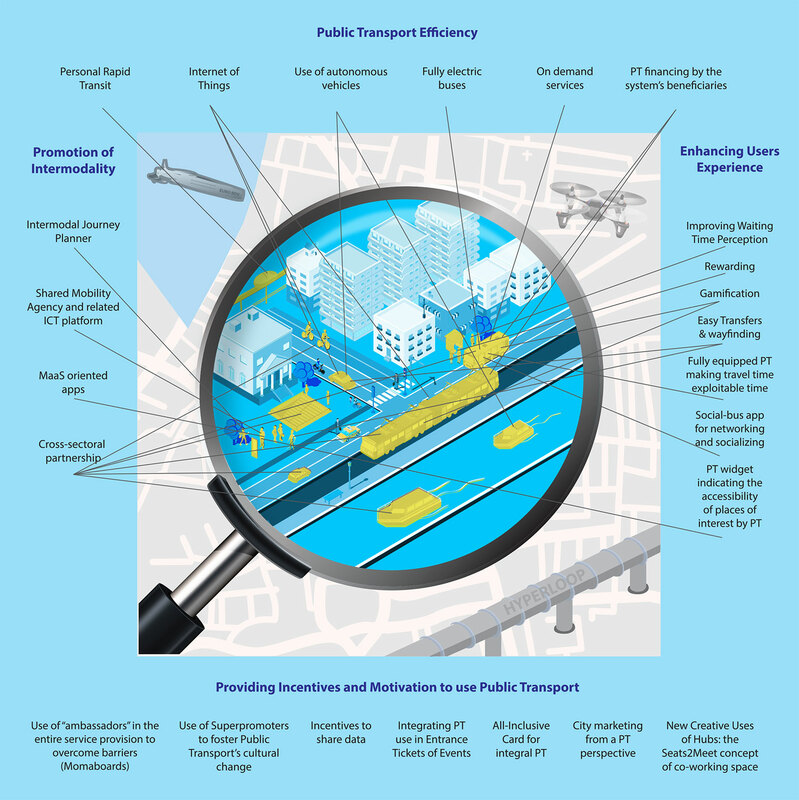 Consult the full CIPTEC Toolbox report to be guided on how you can implement innovation in Public Transport (D5.1, available through the CIPTEC project’s website). Consult the interactive online toolbox, and use the filtering criteria to fine-tune your research and find the innovation that is most suitable to address your needs. Do not hesitate to add to the digital toolbox the promising new innovations that you have experienced, share your knowledge with everyone! None innovative concept can be directly transferred from one context to another, even though the cases may share some similar characteristics. Innovations (solutions/measures) should be selected, evaluated (in a pre-feasibility study stage) and customised (in a feasibility study stage) based on your local targets and requirements. Their specifications will be determined through the analysis of the ‘reference context’ where they will be applied, the organisation’s planned objectives and the operational conditions, all of which are interrelated. The reference context is a complex mix of a wide range of elements, among others, the operational and organisational schemes of Public Transport; the composition and features of the targeted end-users; the urban area dimension (size), reflecting on the type of services operated (e.g. metro, light/urban railways, tram); the Public Transport network (e.g. main corridors/trunk and feeder connections, radial lines), etc.. Technological and organisational initiatives of the present day become mainstream application systems of tomorrow. New global and local issues, trends, demands arise continuously. But cities have unique characteristics, local problems, challenges and priorities resulting to the development and predominance of a particular mix of transport services, as an answer to global and local needs. In this section, we present and describe certain innovative concepts resulted from our review and evaluation of existing ones and also from the ones resulted from the CIPTEC co-creation workshops and crowdsourcing campaigns. Any attempt to describe an ideal mix of Public Transport services and innovations in a Future City would be very subjective and abstract. Our attempt, to select promising Public Transport innovations and present them as a possible application mix in an idealised future city, should be considered under the light of the aforementioned elements, subjectivity and abstraction. The concepts selected for the Future City have been classified in four fields of application concerning Public Transport.